The online testing system (COAsT) has a feature called ‘Question Shuffle’ which allows students to attempt individual questions, without having to take a whole test. So in addition to all of the premium tests which you can assign to students, there are over 5000 practice questions available in Question Shuffle, covering all four subjects – English, maths, verbal and non-verbal reasoning. Sometimes students don’t have time to fit in a whole test, but still have time to do a little bit of practice. This is why we added question shuffle. It allows the student to take as many questions as they like in the time they have available without wasting a whole test. Question Shuffle also allows students to select a specific question type to practise. Students must first sign in to their own Student account. Go to ‘My 11plus’. 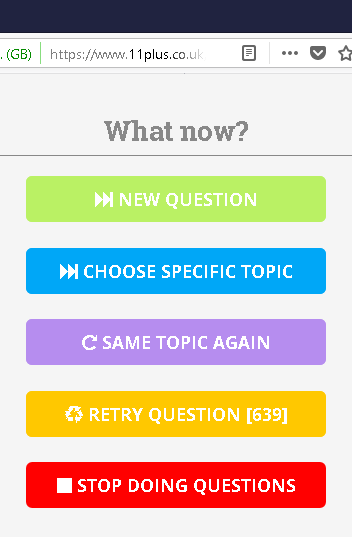 There is a button which says ‘PRACTISE NEW QUESTION’. Click it and away you go! You can try this feature for free with limitations – 10 questions per day and no timer bar. Everybody who has bought Credits (to assign previous mock tests and other premium tests) within the last year will get unlimited access to Question Shuffle. Doing well in entrance tests is all about being able to work accurately under time pressure. This is why we show a timer bar above each question. The idea is to complete the question before the timer bar gets to the end and turns red. The time allowed is based on the average time taken by all the other students who also did the question. It may seem daunting at first but after a while students get used to it and actually enjoy the challenge of trying to complete the question before the timer bar gets to the end. If you want to try a specific type of question there is a way to do so. In the Student account go to ‘My 11plus’ then click ‘View Results’. A screen will open on the tab ‘By Topic’ showing a list of question types in the ‘TOPIC BREAKDOWN’. Expand the question types to reveal sub-types. On each type there is a button which says ‘DO THIS TYPE’. Click it and it will give you a question of that type. Once you have submitted the question, then you can either choose to do another one of the same type or a totally new question type.